"Thank you, it was a very fun and educational camp", said a 3rd grade student. 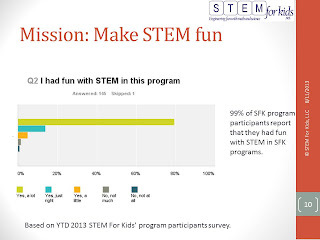 The best part about STEM For Kids’ programs is “getting the students to finally think critically pertaining to real world situations.“, a K-8 public school teacher in North Carolina. “… campers left with a better appreciation of the structures around them as well as the importance to communicate and work together.”, STEM For Kids' STEM Coach in a blog about life of a STEM Coach. 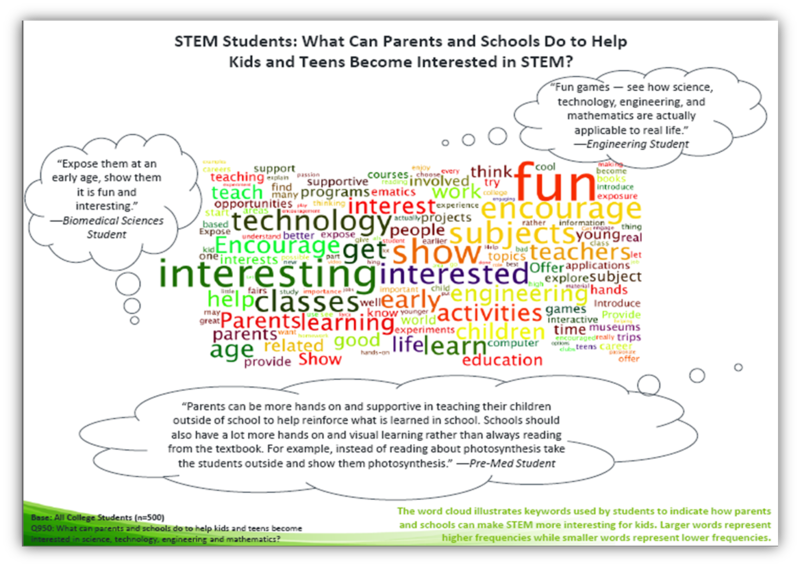 These and numerous other feedbacks from parents, campers and educators encourage us and help us make continuous improvement towards our two-fold mission of making STEM fun and real. With 7 months of 2013 already under our belts, we asked ourselves, how are we doing in progress towards our mission? 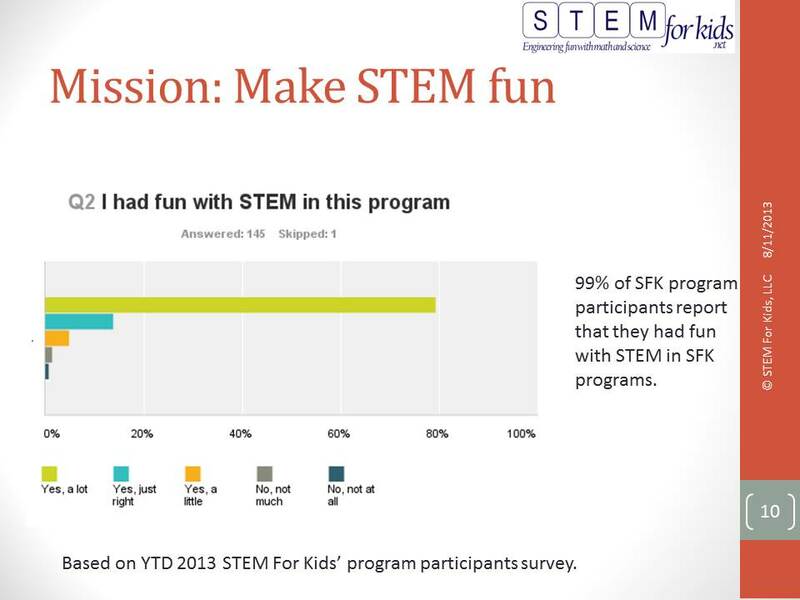 99% of SFK program participants report they had fun with STEM in SFK programs. Thanks to our innovative curricula that is uniquely designed by engineers and people in industry to bring complex engineering/business concepts to a child’s level while engaging them with hands-on activities and challenges. 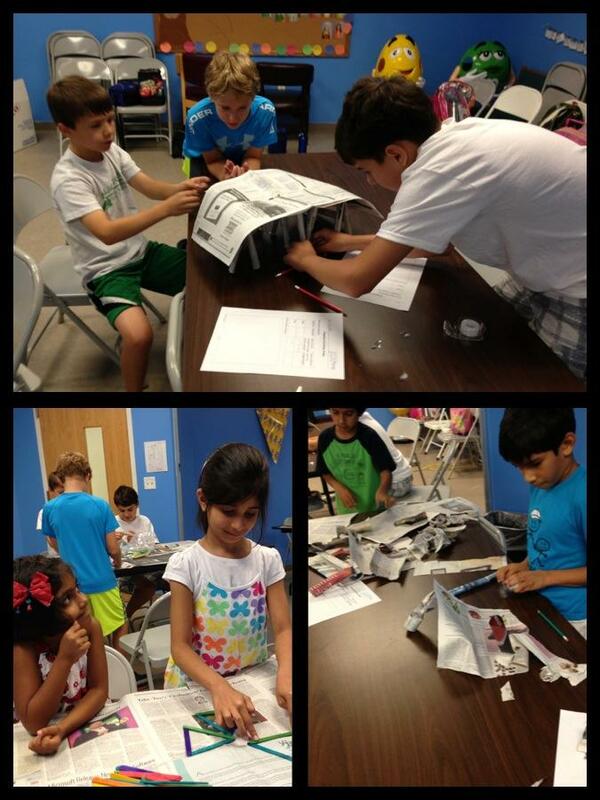 In our programs, children build poppers, the stopping droids, Avatars, windy cars, robots, design bridges and skyscrapers, launch rockets, play action-reaction tag, race their gators, and a lot more. 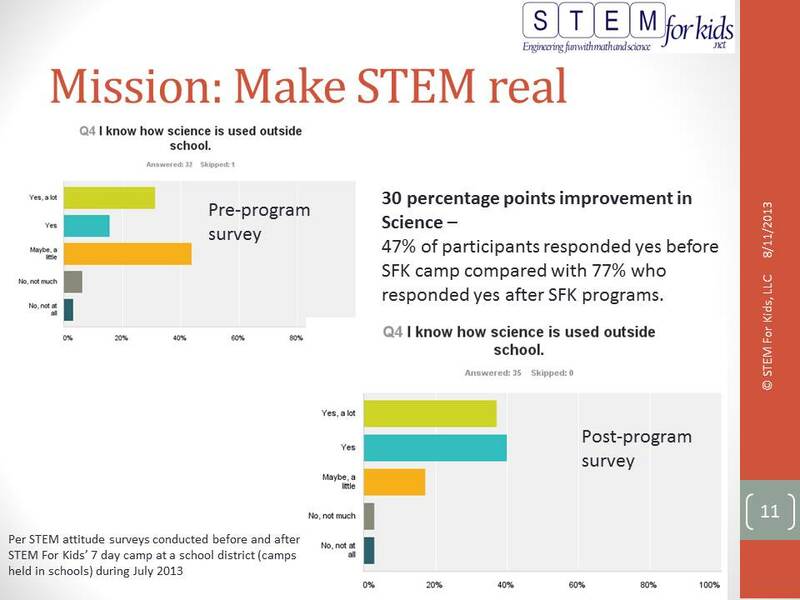 On the REAL front, we observed a 30% percent point improvement in children’s knowledge of how science is used outside school after they participated in a STEM For Kids’ 7 day camp. Making strong connections to the real world is a priority as stated in our organization’s mission. In the end, we are striving to get children prepared for life skills for the real world. Our program participants experience 3Cs of critical thinking, collaboration and communication; they budget, manage to time constraints, work in teams, use technology as a tool, conceptualize ideas and share with others. Selected guest speakers in SFK programs are bolstering our efforts by bringing industry perspectives to further feed campers’ curiosity. Recently young minds in grades K-5 made a connection between their robotic creations and NASA’s Curiosity mission to Mars through an exciting presentation by NASA Solar System Ambassador, Marc Fusco. Read News and Observer reporting of the event here. 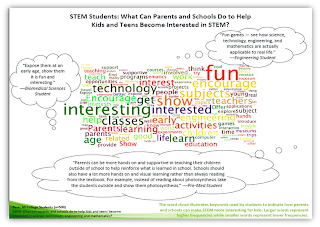 By: Moni Singh, Founder and CEO, STEM for Kids, LLC. Mrs. Singh offers a unique perspective on innovation in education through her three lenses: as a mother of elementary age children strongly focused on making STEM fun for kids; as an engineer and a technologist who has brought several technologies to the market, from wireless phones to smart meters; and as a business leader who understands through her work across global organizations that success in the 21st century requires skills in addition to pure technical competence. You can find her at LinkedIn, Twitter, and Facebook. I got this advice when I was deciding on an engineering field of study among the many possible choices, Civil, Mechanical, Industrial, etc. It was enticing for someone living in the 120 degrees Fahrenheit scorching heat of Delhi without access to air-conditioning. If that reason was not good enough, computer science held the promise of jobs involving creation of the most cutting-edge technologies. Creating something totally new … now that was quite a motivator. I decided for computer science and was blessed with opportunities to create many new technologies … from enabling wireless telephony and satellite communications to bringing data to cellphones. Two decades later, the potential for exciting jobs still remains. Moreover, “Degrees and Jobs” image (source: CSTA – The National Imperative for K-12 Computer Science Education) below depicts the shortage of Computer Science graduates needed to fill the computing related jobs in the US. Computer science and the technologies that it enables are integral part of our lives today. With digitization, our world, our work environments and our workforce have seen significant transformations. For our children to be prepared for the 21st century, some foundational computer science skills and knowledge are needed whether or not they eventually decide to pursue a career in computer science. Just like the foundational skills of math and literacy, computer science education needs to start with elementary ages. I have highlighted the need for early STEM exposure in my prior blog, the Big Bang Theory of Early STEM. 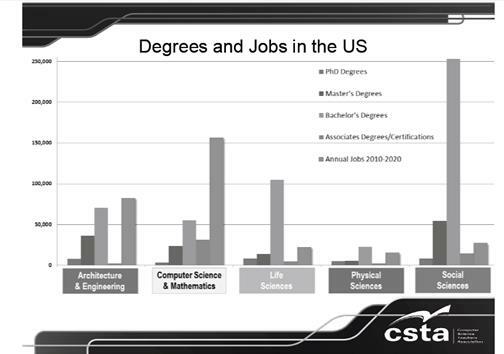 (iv) helping colleges and universities produce more graduates in fields needed by American employers. Notice that two of the listed purposes specifically mention making computer science available at the elementary level. Through camps and collaboration with different school districts, we are furthering the fun of STEM to K-5 children in and outside schools. What are your thoughts on making computer science programs accessible for elementary kids? Follow the discussion further and share your thoughts on BlogSpot, Facebook and Twitter. The main characters, Leonard and Sheldon are brilliant physicists, the kind of "beautiful minds" that understand how the universe works. In this particular episode they meet Professor Proton. They grew up watching Professor Proton's science shows on TV and reminisce how the Professor has been an inspiration for them and several others like them who are innovating, discovering new frontiers of science, engineering and technology. 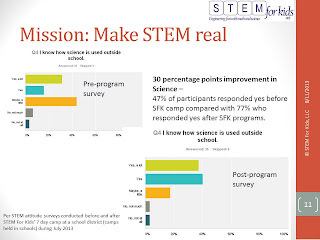 Childhood exposure to STEM can have a lasting impact. I have always believed in exposing children to STEM fields early ... Belief and popular anecdotes aside. Research suggests the same. Thankfully, today, some children have the option to engage with and experience the fun side of science and technology at an early age. When selecting the right program, always remember that STEM without the 21st century skills is like putting colors in air (no canvas)! For the colors of STEM to take effect, you need the canvas of 21st century skills of Communications, Collaboration and Critical Thinking.